It was Times Square at night that inspired Greek-born artist Stephen Antonakos (1926-2013) to begin working his magic in neon. He is said to have loved the garish colors and the tubes of light. Neuberger Museum of Art now reverberates with his spectacular “Procenium” installation, completed in 2000 and designed specifically for the space it now occupies – the Theater Gallery. The installation is reintroduced to the public alongside a new exhibition called Bending Light: Neon Art 1965 to Now, which is on view through June 24. 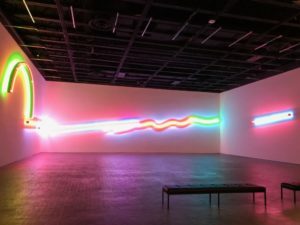 The exhibition includes the work of twelve artists who collaborate with skilled glass-benders to produce neon works, thus the reference to bending light. Under the curatorial baton of Helaine Posner, Chief Curator, and Avis Larson, Assistant Curator, the works appear to be jumping off the walls with light, color and spatial references. Posner describes the work as “akin to spirituality and divine presence.” This idea was probably not in Antonakos’s mind when he began working in neon: “I simply thought so much more could be done with it abstractly than with words and images.” Nonetheless, the results are “luminous environments that are both tangible and transcendent,” says Posner. It was sheer pleasure to share an after-party with Naomi Spektor Antonakos, the artist’s wife, and Irving Sandler, his longtime friend and colleague, to celebrate the genius of Antonakos and the artists who pioneered the transformation of neon from an advertising platform to an art form. After all, before their artistic breakthrough, neon was just a bunch of trapped gas in an “Eat Here” sign.